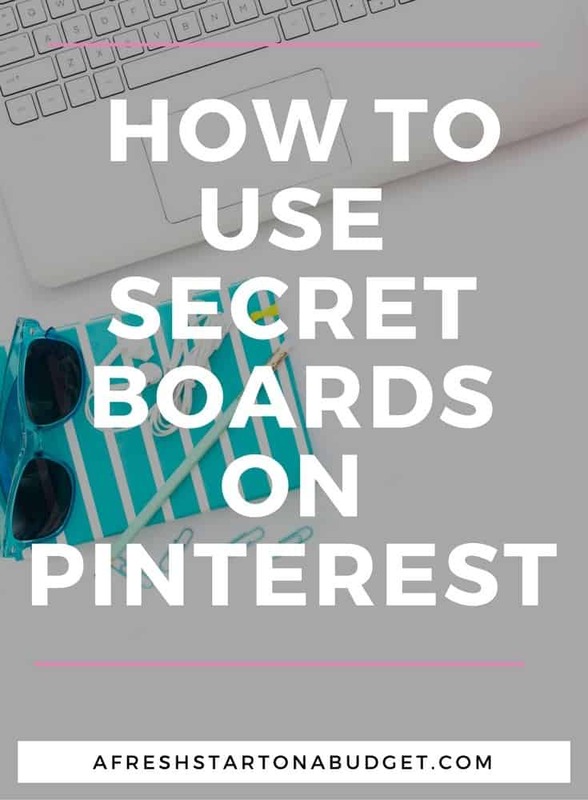 Have you ever used secret boards on Pinterest before? I’m a fan of them for a few different reasons and I am going to share with you how I use them and maybe give you some ideas on how you can be using them too. Secret boards are boards on your Pinterest that only you can see, they are secret! Only you will know they exist. I want to show you how to use secret boards and why they are helpful. One of the ways I use secret boards is when I’m creating a new board to my Pinterest. I will make it a secret board first so that I can fill it up with at least 40 pins before I make it public. I don’t like to have boards that are public with only a few pins. I want when new people discover my Pinterest account that they find full boards filled with amazing pins. So I keep new boards secret till I’m ready to share them publicly. I use to have lots of boards on my Pinterest of things I was interested in desserts, Holidays, foods to make, etc. I have recently switched my blog to be more niche specific. I went from a multi-topic lifestyle blog to a more specific blogging and business focused blog. I want when people find my Pinterest for them to realize my focus. So I made a lot of those boards not related to blogging or business secret. I still want to have them. I might need a Holiday craft or a dessert idea but they don’t fit my brand anymore. So they are in secret boards. To make a public board secret all you need to do is go to that board, click edit board then go down to secret and switch from no to yes. Then if you want to make a secret board public you go and switch from yes to no. Simple as that. One last way that I use secret boards that works is that I let my daughter who is nine have a board on my Pinterest so she can pin stuff. That way I can still monitor what she’s pinning since I don’t let her have her own Social media. This would also work if you had something you didn’t want shared publicly but still use Pinterest for. Say you are planning a party or looking for a gift for your spouse. You could make a board with ideas. Then only you could see it and plan in secret. Need some more tips for Pinterest? Here are some posts you can check out. Learn how to set up Rich Pins. 15 Pinterest Tips that really work. These are great suggestions. I can’t wait to see what the other 30 days of blog growth are! Love this! I always use secret boards but now they mean so much more! I’m subscribing! I need to follow from day one so that I, too, can build my online presence. I use my secret boards as bookmarks, kind of. I also use them to keep track of gift ideas for family and friends.